This book covers advanced Word, Excel, Access, and PowerPoint. Move students beyond the point-and-click. The goal of the Exploring series is to move students beyond the point and click, to understanding thewhy and how behind each skill. And, because so much learning takes place outside of the classroom, this series provides learning tools that students can access anywhere, any time. Students go to college now with a different set of skills than they did years ago. With this in mind, theExploring series seeks to move students beyond the basics of the software at a faster pace, without sacrificing coverage of the fundamental skills that everyone needs to know. NOTE: Before purchasing, check with your instructor to ensure youselect the correct ISBN. Several versions of Pearson's MyLab & Mastering products exist for each title, and registrations are not transferable. To register for and use Pearson's MyLab & Mastering products, you may also need a Course ID,which your instructor will provide. 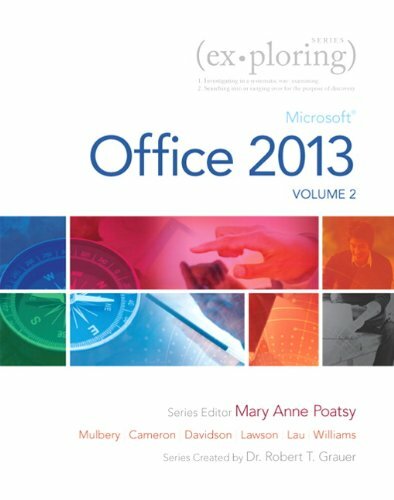 Ideal for students and individuals seeking an introduction to Microsoft Office 2013. The "Exploring "series charts readers beyond the "point and click," helping them understand WHY they use Microsoft Office skills along with HOW they perform them. The latest edition provides an easy-to-follow map through each chapter to help readers learn, study, and review efficiently and be successful in this class and beyond. The entire approach allows students to map their way quickly and easily through the book, focusing on the key objectives, and using their own efficient study habits as a model for success. Teaching and Learning ExperienceThis program will provide a better teaching and learning experience-for you "and" your students. Here's how: "Personalize Learning: " MyITLab delivers proven results in helping students succeed, provides engaging experiences that personalize learning, and comes from a trusted partner with educational expertise and a deep commitment to helping students and instructors achieve their goals. "Move Beyond the Point and Click" Students can move beyond the basics of the software at a faster pace, without sacrificing coverage of fundamental skills. "Extend Learning Beyond the Classroom: "A lot of learning takes place outside of the classroom, and the "Exploring" series provides learning tools that students can access anytime, anywhere.